I received an email yesterday morning that truly made my day. Groundwork Opportunities, a charity organization in San Francisco working to create a world without poverty, reached out to me with an update on my fundraising for bikes in Cambodia. If you clicked on the link above and read my fundraising posts - you'll note that I thought the bikes would be $50.00 each. Well the Sao Sary Foundation was able to secure $25.00 bikes! That means my humble fundraising total of $255.00 went a very long way. Thank you SO much to all who donated. I want to share the below results with all of you and thank you for making a difference in the world. 100% of your donations went directly to the cause. I am still fundraising! Please spread the word! I am just writing to let you know that we had the privilege of visiting Cambodia this past week. We sent 100% of what you raised on your campaign so far, $255, to the field. And, during my visit, on May 27th, we were able to witness the purchasing of 10 additional community bikes with the money you raised. 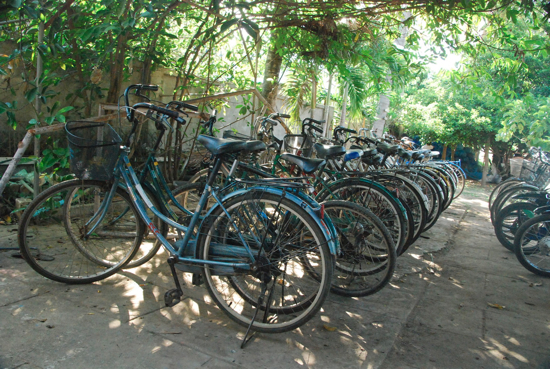 Your campaign helped purchase 10 additional community bikes for the Sao Sary Foundation in Cambodia. There is open access to all 35 bikes currently in use at the Sao Sary Foundation child protection center and guest house. This program makes going back and forth to school possible for many beneficiaries since most schools do not have a bus system providing transportation services to children in the Kampong Speu Province. 3 of the bikes were also provided to 3 women in the village of Kball Tralac, making it easier for them to collect water for their crops to increase their income. All of the bikes have been marked to show they are owned by the SSF. Members of the SSF abide by a rental policy that requires them to sign in and out which bike they are using, and when. This allows the SSF to monitor how many are checked out, and where they are located during the course of check out. I have attached some photos from this past week while we were out in the field. If you continue your campaign and raise more funds, we will send 100% of those funds to the field as well.